Recover contacts, photos, messages, videos, notes, call logs, and more. Recover data from iPhone, iPad, iCloud and iTunes. Compatible with the latest iPhone XS Max, iPhone XR, iPhone XS, etc. Recover from iOS Devices directly. Restore from iTunes or iCloud backup. 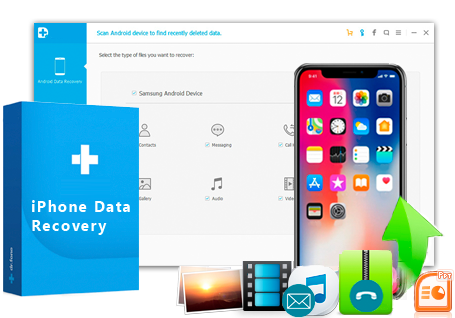 This is the world's best iPhone data recovery software, it is equipped with the top data recovery technology, with this iOS data recovery program you can easy retrieve deleted photos, contacts, messages, videos or other data from iPhone, iPad, iPod touch, etc. If you have accidentally deleted important data from iPhone, iPad or other iOS device, and want to recover data from your iPhone XS Max, iPhone XS, iPhone XR, iPhone X, iPhone 8, iPhone 7, iPhone SE, iPhone 6, iPad or other devices, our Data Recovery software is the best choice for you, all your data will be retrieved easily with the help of this top iPhone data recovery software. Step 1: Select "Recover from iOS Device" mode and connect your device. After detection, the iPhone Data Recovery will display your device name on the interface. Step 2: Select the one you want to restore to scan and click "Start Scan" button to start scanning the deleted data. Step 3: Select the files you want to recover and click "Recover" button to get back and save your iOS data on your PC. Have you deleted important data like photos, messages or contacts from iPhone? Maybe you are worried to find an effective data recovery software to retrieve data back, iPhone data recovery is the best software for you, it can recover data from iOS devices like iPhone or iPad directly, you can safely restore lost contacts, videos, messages and photos from iOS devices directly. If you have backed up your iOS data on iCloud before, you can use this software to retrieve lost data from iCloud account. You just need to launch this iPhone data recovery software, click "Recover" on the iCloud backup file tab, sign in your iCloud account with your Apple ID and password, the software will automatically search backup files and show you a list of backup history, and now you can select the data you want according to the device name, data, file size, iOS version number and iCloud account. Once you click the "Download" button you are available to save selected backup file to your computer. With the help of this iPhone data recovery software, you can recover your data from iTunes backup, once you connect your iPhone, iPad or other iOS device to the computer, iTunes will automatically create a backup for your iOS device, if your iPhone or iPad are lost, stolen or damaged, you can retrieve lost files by extracting the data that you have backed up to iTunes before. Run this iPhone data recovery software and click "Recover from iTunes backup file" tab, and then select to recover backup files according to its indicated device name and date. The best iPhone data recovery software can help you to solve different data loss issues. Data loss after accidental deletion, iOS upgrade failure and device get damaged, device lock but forget the password, iOS upgrade/jailbrake failure, device stuck at white Apple logo or recovery mode factory settings restore or device reset iOS devices are attacked by virus, etc. the above issues can all be solved by this top iPhone data recovery software. This iPhone data recovery program is simple to use, you can retrieve data from iPhone or iPad with simple three steps. The first step is to scan lost data: Connect your iPhone or iPad to your computer, the data recovery software will scan your iOS devices or iTunes/iCloud backup to find the lost photos, videos, messages or other data. The second step is to preview and Search: You can preview the data with detailed information to decide the items that you want to recover. The third step is to recover lost data: Select the files that you want to recover and save them with the one click "Recover" button, and then you can retrieve files to computer or device. iOS: iOS 11, iOS 10.3, iOS 10, iOS 9 and former. Amazing Zachary The iPhone data recovery software is very nice and also very useful, thank you! You have done well! PRITH I lost my contacts without backup on iCloud, but after I get them back by this excellent iPhone X data recovery software, I'm very thankful for your help. My best choice Jennie Pless The iPhone XR data recovery has read a lot about it and they seem to me to be wonderful, thank you for this amazing tool. Love it Alevtina This application recovered my deleted photos and notes! It allows you to view photos names and also copy/paste note contents. Great iPad data recovery software, saved a lot of headaches! Thanks Islam This is very easy to use and pretty intuitive, thank you so much for the help with my cellphone. You are the only ones out of numerous sites and carries that could help me with my issue and not lose my data. I just can't thank you enough! Easy to use Bruce Smith This iPhone XS Max data recovery program really retrieved the contacts that I accidentally deleted. It was a relief cause I badly needed the information in it. It was worth downloading. Excellent software Anthony Park I bought this iPhone data recovery to recover contacts, SMS, notes, call logs, photos, videos, etc. on my iPhone or my iPad.